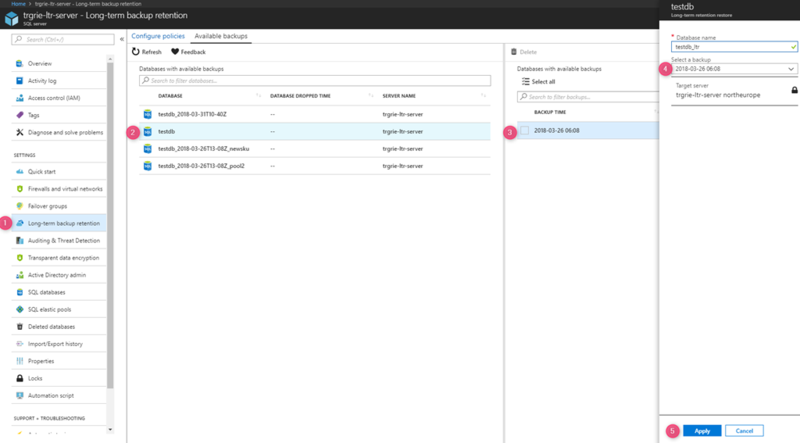 The preview for long-term backup retention in Azure SQL Database was announced in October 2016, providing you with a way to easily manage long-term retention for your databases – up to 10 years – with backups stored in your own Azure Backup Service Vault. Based upon feedback gathered during the preview, we are happy to announce a set of major enhancements to the long-term backup retention solution. With this update we have eliminated the need for you to deploy and manage a separate Backup Service Vault. Instead, SQL Database will utilize Azure Blob Storage under the covers to store and manage your long-term backups. This new design will enable flexibility for your backup strategy, and overall more control over costs. More regional support – Long-term retention will be supported in all Azure regions and national clouds. More flexible backup policies – You can customize the frequency of long-term backups for each database with policies covering weekly, monthly, yearly, and specific week-within-a-year backups. Management of individual backups – You can delete backups that are not critical for compliance. Streamlined configuration – No need to provision a separate backup service vault. What happens with your existing long-term backup retention policies? Your existing backups will be automatically transitioned to the SQL Database managed RA-GRS storage containers. All existing long-term backups are already copied from your recovery vaults to the new storage containers free of charge. The new API that supports the enhanced feature set will be available in parallel with the existing API until May 31, 2018. You are expected to update your configuration scripts to the new API by that deadline. Note, backups associated with servers that are already dropped are not migrated. The following diagram illustrates how you can configure a new long-term retention policy for a database. The long-term policies for individual databases are shown in a single table as illustrated by the next diagram. The next diagram illustrates how you can restore a specific long-term backup. How will this impact your bill? Effective August 1, 2018 if you are using Recovery Service vaults for LTR backups you will notice a new charge on your bill with the name LTR backup storage. The new LTR solution is more cost efficient, which can mean lower overall long-term backup retention storage costs. 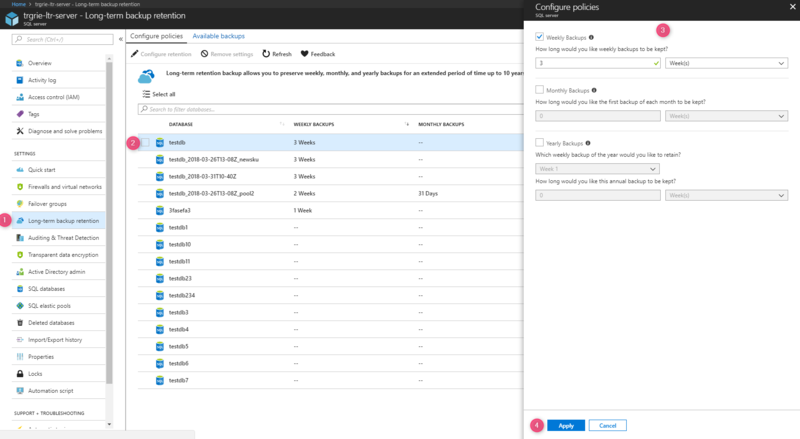 In addition, the added flexibility in the backup retention policy helps you reduce costs even further by letting you select less frequent backups, e.g. once a month or once a year, or by deleting individual backups that you don’t need. Does long-term retention impact my GDPR compliance? If the backup contains personal data that is subject to General Data Protection Regulation (GDPR), you are required to apply enhanced security measures to protect the data from unauthorized access. In order to comply with GDPR, you need a way to manage the data requests of data owners without having to access backups. This layer of protection to the personal data stored in backups can be achieved by storing only "pseudonymized" data in backups. For example, if data about a person needs to be deleted or updated, it will not require deleting or updating the existing backups. You can find more information about GDPR best practices in Data Governance for GDPR Compliance. Learn more about Azure SQL Database long-term backup retention. Learn how to configure Azure SQL Database long-term retention. 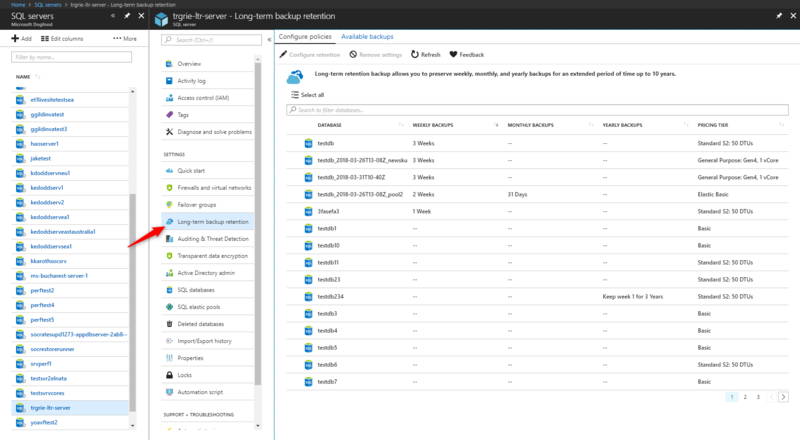 Learn how to restore from an Azure SQL Database long-term retention backup.